Another common cause of tooth discoloration is pulp canal obliteration (PCO). Classified as either partial or total,5 this is normally caused by a traumatic injury.6 Severe trauma may cause pulpal necrosis, while moderate injury may cause PCO.7 Pulpal necrosis as a consequence of PCO has been found to be rare. Andreasen et al7 reported this occurrence in less than 1% of cases, while Oginni et al8 found this occurrence to be higher in teeth with total PCO (43%) compared to partial PCO (14%). Some studies have identified reduced transparency or yellowish discoloration of the tooth crown, regardless of the degree of obliteration.4,6 In the clinical experience of the authors, the degree of obliteration of the pulp chamber has a direct correlation to the intensity of color change, which can range from mild yellowish to dark yellow/brown. The purpose of this clinical report is to present a simple and conservative treatment approach for the esthetic management of dark teeth with different etiologies in the same patient. A 40-year-old Hispanic female with unremarkable medical history presented with a concern that her left maxillary central incisor (#9) and right maxillary lateral incisor (#7) were discolored (Figure 1 and Figure 2). Her dental history revealed previous orthodontic treatment in her teenage years, and she attributed her tooth discoloration to the orthodontic treatment. A clinical examination of the area of concern revealed a composite restoration on the lingual fossa (access for the canal) and Class III composite restorations on the mesiolingual and distolingual surfaces of the central incisor (#9), while the lateral incisor (#7) was intact. The patient was caries-free and maintained good oral hygiene and regular prophylaxes. Periapical radiographs revealed root canal treatment, with a 10-plus-year history on the central incisor (#9), and PCO on the lateral incisor (#7). The patient had no recollection of trauma to this area. In addition, no periapical lesions or widening of the periodontal ligament space were found (Figures 3A and 3B). FIGURE 2. Preclinical retracted view. The patient had an endodontic consultation, which included an intraoral exam, shifted periapical radiographs, and a cone beam computed tomographic image to assess the presence and type of calcification. Electrical pulp testing of the right maxillary lateral incisor (#7) was within normal limits, but the tooth exhibited a delayed response to cold. A diagnosis of partial PCO with a normal periapex was established, with no treatment indicated at this time. 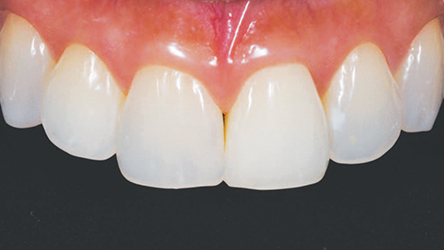 Due to the patient’s desire to conserve tooth structure, a minimally invasive treatment option was presented that consisted of nightguard bleaching. FIGURES 3A and 3B. Periapical radiograph of the maxillary right lateral incisor that presented partial pulp canal obliteration and no periapical lesion (A), and periapical radiograph of the maxillary left central incisor to evaluate root canal treatment (B). A horseshoe-shaped stone cast was made from an irreversible hydrocolloid impression of the patient’s maxillary arch to facilitate fabrication of a vacuum-formed thermoplastic tray for use as the bleaching carrier. The bleaching process was divided into two phases. The first phase included use of a modified single-tooth tray so that both dark teeth were isolated from the rest of the arch and bleached at the same time until they matched the adjacent teeth. The second phase included use of a maxillary full-arch tray to stabilize and achieve uniformity in the shades across the arch. FIGURE 4. Bleaching tray with a modified design to be used to treat a discolored tooth or teeth. The design for the single-tooth tray was nonscalloped, nonreservoir, with the teeth molds on either side of the discolored teeth cut out (Figure 4). An “X” was placed on the stone cast on the right canine (#6), right central incisor (#8), and left lateral incisor (#10) to ensure the tray was cut out in those areas. The design for the full-arch tray was also nonscalloped, nonreservoir and covered all teeth in the patient’s maxillary arch. The patient was given 10% carbamide peroxide bleaching gel and instructed to use the single-tooth tray, only applying bleaching gel to the right lateral incisor (#7) and left central incisor (#9), and to wear the ­tray overnight for two weeks. At the conclusion of phase one, the shades of the right lateral incisor (#7) and left central incisor (#9) matched the adjacent teeth (Figure 5). 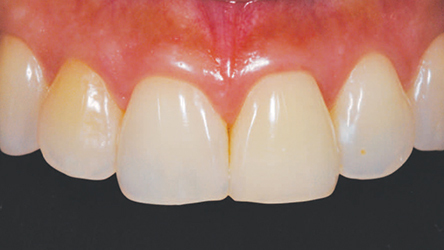 The patient was instructed to use the full-arch tray and apply the bleaching gel to all maxillary teeth, wearing the tray overnight for an additional two weeks. She reported no sensitivity or adverse side effects during the duration of the bleaching. At the conclusion of phase two, a uniform shade was achieved to the patient’s satisfaction (Figure 6 and Figure 7). FIGURE 5. 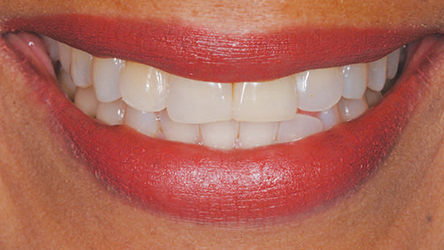 After two weeks of treatment, both dark teeth exhibit a shade similar to the neighboring teeth. FIGURE 6. Completed treatment. All maxillary incisors were bleached using a conventional nonscalloped, nonreservoir tray. FIGURE 7. Patient portrait with full smile for esthetic evaluation. In summary, discolored teeth can present numerous clinical challenges, ranging from determining etiology to formulating an appropriate treatment plan. The patient in this report was offered a conservative resolution to her chief complaint through simple nightguard bleaching. The results were pleasing to the patient, and no tooth structure was sacrificed. In a time in which operative treatment seems to be the default for esthetic dentistry, it is important to remember that more conservative options are often available. Another common cause of tooth discoloration is partial or total pulp canal obliteration, which normally results from trauma. 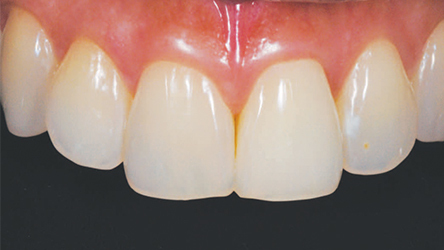 Clinicians must understand the etiology of discolored teeth and carefully weigh all clinical options — including nightguard bleaching — before initiating treatment. Markley MR. Restorations of silver amalgam. J Am Dent Assoc. 1951;43:133–146. Watts A, Addy M. Tooth discolouration and staining: a review of the literature. Br Dent J. 2001;190:309–316. Schaefer O, Watts DC, Sigusch BW, Kuepper H, Guentsch A. Marginal and internal fit of pressed lithium disilicate partial crowns in vitro: a three-dimensional analysis of accuracy and reproducibility. Dent Mater. 2012;28:320–326. Plotino G, Buono L, Grande NM, Pameijer CH, Somma F. Nonvital tooth bleaching: a review of the literature and clinical procedures. J Endod. 2008;34:394–407. Andreasen JO. Luxation of permanent teeth due to trauma. A clinical and radiographic follow-up study of 189 injured teeth. Scand J Dent Res. 1970;78:273–286. Jacobsen I, Kerekes K. Long-term prognosis of traumatized permanent anterior teeth showing calcifying processes in the pulp cavity. Scand J Dent Res. 1977;85:588–598. Andreasen FM, Zhijie Y, Thomsen BL, Andersen PK. 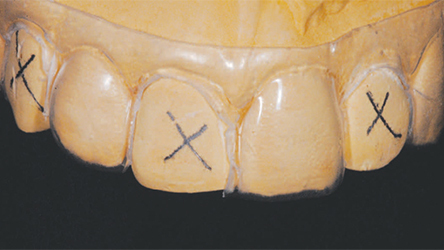 Occurrence of pulp canal obliteration after luxation injuries in the permanent dentition. Endod Dent Traumatol. 1987;3:103–115. Oginni AO, Adekoya-Sofowora CA, Kolawole KA. Evaluation of radiographs, clinical signs and symptoms associated with pulp canal obliteration: an aid to treatment decision. Dent Traumatol. 2009;25:620–625. Delivanis HP, Sauer GJ. Incidence of canal calcification in the orthodontic patient. Am J Orthod. 1982;82:58–61. Popp TW, Artun J, Linge L. Pulpal response to orthodontic tooth movement in adolescents: a radiographic study. Am J Orthod Dentofacial Orthop. 1992;101:228–233. Amir FA, Gutmann JL, Witherspoon DE. 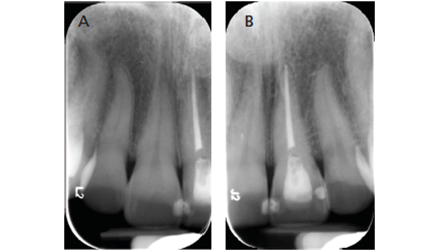 Calcific metamorphosis: a challenge in endodontic diagnosis and treatment. Quintessence Int. 2001;32:447–455. Haywood VB. Considerations for vital nightguard tooth belaching with 10% carbamide peroxide after nearly 20 years of proven use. Inside Dentistry. 2006;2:2–5. Ritter AV, Leonard RH Jr, St Georges AJ, Caplan DJ, Haywood VB. Safety and stability of nightguard vital bleaching: 9 to 12 years post-treatment. J Esthet Restor Dent. 2002;14:275–285. Schwartz RS, Summitt JB, Robbins JW. Fundamentals of Operative Dentistry: A Contemporary Approach. Chicago, Ill: Quintessence Publishing; 1996. Todd M, Brackett W, Romero M. Correction of a single discolored anterior tooth due to internal resorption: a clinical report. Compend Contin Educ Dent. 2017;38:e13–e16. Haywood VB, DiAngelis AJ. Bleaching the single dark tooth. Inside Dentistry. 2010;6:42–52. From Decisions in Dentistry. December 2017;3(12):22—25. David Urbanawiz, DMD, is an instructor in the Department of Restorative Sciences at The Dental College of Georgia at Augusta University. His teaching and research interests include restorative dentistry, esthetics and photography. 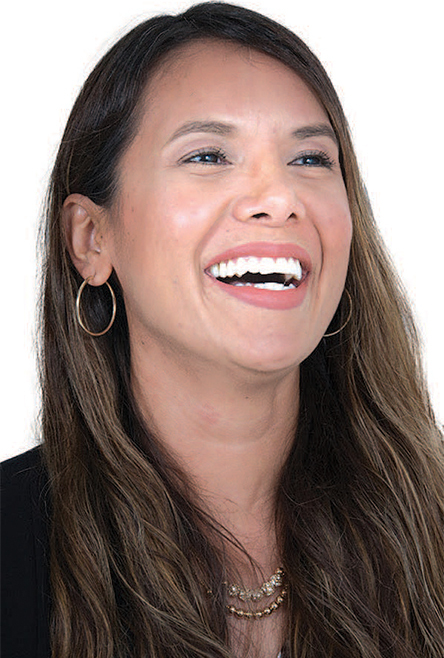 Courtney S. Babb, DMD, is an instructor in the Department of General Dentistry at The Dental College of Georgia at Augusta University. She was an associate in private practice for 5 years before pursuing an academic career.